Last Jet To Gotham; The Perilous Capers of the Terrible Teen; Batman's Backgrounds for Action; Wanted -- the Capsule Master! ; The Charge of the Sea Soldiers! Called to Gotham Airport when word that mobster Joe Angel is trying to sneak back into the country, Batman and Commissioner Gordon are at the ready to capture him when he lands. However, the airplane mysteriously crashes into the ocean when it's caught in a water-spout. Batman calls his ally Aquaman for help regarding the crash and the monarch of the sea tells the caped crusader that he was responsible for the crash. Getting air-dropped near the crash site, Batman dives down to investigate what happened. On the ocean floor, Batman finds that the people aboard are still alive inside the plane because there cabin is still pressurized and they have air left. He's then attacked by men in scuba gear whom he fights off. He's next attacked by Aquaman who rips off his diving gear, and dragged away. 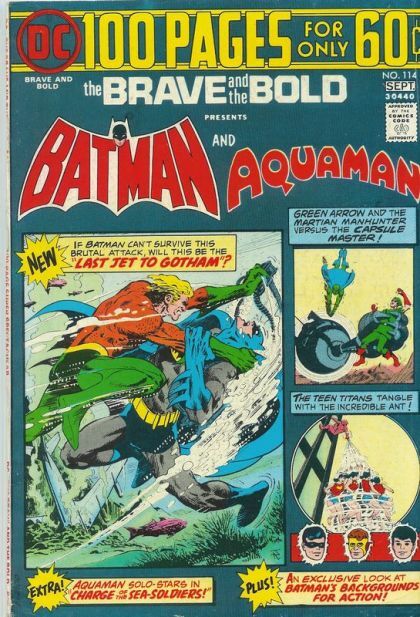 Revived aboard Aquaman's Golden Dolphin submarine, Batman learns the truth behind Aquaman's actions. Aquaman had learned that aboard the plane is a nuclear bomb that has been placed in there by opium dealers to get revenge against the United States over their pressure to destroy Poppy crops across the world. The bomb was set to be pressure sensitive and once it landed at Gotham Airport it would detonate. Aquaman acted in the interest of Atlantis, because such an explosion would cause a war between countries that would wipe every living thing off the map. Batman refuses to allow the people aboard the plane to be sacrificed even if it means preventing nuclear war, and convinces Aquaman to help him come up with another way to stop the bomb. They return to the crash site to find that the US authorities had recovered the plane. The two heroes then rush to stop it from being brought to Gotham Airport, however have opposition from the Opium dealers. In the end, the two heroes succeed in their task and have the bomb removed and disposed of before the plane is returned to the airport. Batman thanks Aquaman for his help before Aquaman returns to the ocean. Meeting at the Titans Lair, the Teen Titans read a letter from their teammate Speedy who thanks them for their aid against the Diablo organization. Robin next reads a letter from Dr. Paul Turner of the Lacklock Camp who asks for the Titans aid because some of the kids attending the camp have gotten into trouble with the law, and so the Titans decide to go to Lacklock Camp to investigate. Arriving at the camp, they learn that Lacklock Camp is actually an open concept juvenile detention centre where Dr. Turner hopes that facilitating an environment of trust and openness can help the trouble kids sent to his camp. After meeting with the kids and signing autographs, the Titans are taken into Turner's office where he shows them reports about a new costumed criminal called the Ant who had appeared shortly after the disappearance of a boy at the cam named Eddie Whit who's father was a circus strong man and the likely suspect. Turner fears that if it is really Whit it would look bad toward his camp and that people trying to shut it down may gain sway in succeeding in their task thinking that Turner's methods are too soft. The Titans agree to take the case after overhearing some of the boys thinking about turning back toward crime after hearing of Eddie's apparent resurfaced criminal behavior. Later that night while patrolling a nearby city the Teen Titans come across the Ant just after he committed a robbery. Attacking him, the Titans are ill prepared for his special costume, and the Ant makes fools out of the Titans before making an escape by hitching a ride on the roof of a subway train. Deciding to check out Eddi's apartment, they arrive and find that the only person present is his younger brother Danny. When Eddie returns home the Titans question him while Kid Flash quickly stakes out the property, and finds a locked up room with an Ant costume inside. Telling Robin, the Boy Wonder excuses Danny from the room and they confront Eddie about his being the Ant. Eddie denies the claim and then attacks the Titans, making his way to his costume stash changing into the Ant and making his escape. Returning to his apartment, the Titans are confronted by Danny who overheard the whole thing and professes his brothers innocence. To prove this, he takes the Titans to the Zenith Caterer building where Eddie works. Staking it out they find that it's really a front for Lazlo Krask and his gang who have been extorting Eddie to go into action as the Ant due to some incriminating evidence. Danny is at first disappointed that his brothers gotten involved in crime again, however Robin assures him that they will find out what Krask has on his brother, and if possible -- clear his name if he is innocent of any wrong doing. Following Krask's gang and the Ant to a charity picnic that the Ant robs, the Titans rig it so that the get away vehicle is being driven by Danny. Confronting his brother, Eddie tells Danny that Krask had evidence proving that Danny was a member of the Sharks gang and in order to keep his brother out of trouble, Eddie agreed to become the Ant. Realizing it was all a lie to exploit Eddie's abilities, he allows Kid Flash to take the stolen money and return it to the charity. When Krask's gang tries to kill Eddie and Danny, the Teen Titans have them led to Camp Lacklock where the Titans deliver the gang a humiliating defeat in front of all the teens to witness. After Krask's gang is defeated the truth is revealed and Dr. Turner tells Eddie that he is still proud and agrees to help him through the legal proceeding that will result as of this capture. A three-page infographic which recounts past Batman and Robin adventures outside of the USA. Wanted -- The Capsule Master! Reporting to a call to halt a jail break, Green Arrow and Speedy are shocked to find that the escaped convicts were wearing masks and under false identities, and surmise they could have broken out of jail at any time. Later they answer a call to the museum where a meteor is stolen. Examining a x-ray photo of the meteor shows that there is some sort of mechanical object within it. Believing that aliens from outer space are involved, Green Arrow calls in help from his fellow JLA member the Martian Manhunter. The two end up trying to stop the three convicts (really aliens) and their master, Vulcor the Capsule Master from retrieving a third object from the bottom of the harbor, but fail in doing so. Traveling to Mars to see what he can learn about Vulcor, Martian Manhunter learns that Vulcor was a prisoner on Mars, imprisoned for trying to use a weapon against the people there, but he recently escaped. Returning to Earth, the Martian Manhunter, Green Arrow and Speedy all work togeather to try and stop the Capsule Master from retrieving parts of the doomsday device he plans on using against both Earth and Mars. Their first attempt fails when Vulcor uses hypnotic powers on Green Arrow, making him shoot flaming arrows at the Martian Manhunter. Later, the two decide to throw off Vulcor by having Martian Manhunter disguise himself as Green Arrow, and Green Arrow as Martian Manhunter. Their ruse works when they make their final attack on Vulcors capsule, and when expecting to battle Green Arrow, Vulcor has to deal with the Manhunter instead who defeats him and takes him and his men to Mars for punishment. The Charge Of The Sea Soldiers! Evil genius Professor Snark is once more committing robberies at sea, however his first attempt at robbing a ship by having his thugs rob it in a ship disguised as an ice berg is foiled by Aquaman and Aqualad. When his next attempt where he uses a submarine disguised as a whale fails at the hand of Aquaman once more, Snark decides to come up with another method of defeating Aquaman. Days later Snark sets up a legitimate platform in the ocean and invites Aquaman over to see his latest invention: a device that will turn the oceans salt water into fresh water. Aquaman doesn't believe that Snark is doing this for the benefit of mankind. Soon he has to rush to the rescue of a boat being hijacked by pirates. However when Aquaman's undersea friends attempt to board the ship they fall mysteriously ill and they're forced to retreat while the pirates make off with the ship. Aquaman realizes it's because the water has been desalted, and since his undersea army need salt water to operate they couldn't stop the theft. Approaching Snark with this, Snark refuses to do anything about it because technically he isn't breaking any laws. Snark, satisfied that he's found a way to prevent Aquaman from stopping him, then plans a heist of a shipment of exotic animals, however when they attempt to rob them Aquaman and Aqualad arrive with an army of marine animals outfitted with respiration devices that feed them salt water. With these tanks they are able to defeat Snark and destroy his machine before turning Snark over to the authorities.